Now, of course, it’s easy for us to sort of tack this passage on to our story of the Wise Men from the Gospel of Luke, but this really did have to do with the exile. The Presence of God was palpable, moving into the desolation and beginning to re-create Jerusalem. It was time now to shape their life together as a people and as a community. But for us, there is also that undercurrent of eschatological reflection. Our hereafter, our “heaven” as we know it, is not something out there or up there or just up ahead. It is here. We just have to look around and see it. There are streams of souls in procession. We just have to find our place. And yet, even Israel didn’t understand the message any more than we do. God is not promising to make our lives easier, or to fill us with wealth and power, or to put us on top. God is promising to remake us, transform us into something completely different. God is promising not a return to normalcy but a new normal. In fact, if you read it, it’s a new normal for everyone—for all those camel drivers regardless of where they come from—Midian, Ephah, Sheba. In today’s terms, it’s all the camel drivers from somewhere in the Sudan, possibly modern-day Iraq, and probably Ethiopia, descending into the Holy Places not to go to war or to take people into exile but to come together, bringing their resources, and praising God as one. This week we read three Scriptures that make up our Epiphany text. Perhaps we miss Epiphany. It sort of gets overshadowed by all the chaotic over-seasoning that came in the weeks before and the mad sprint toward Lent that is only weeks away. So we put on the green “ordinary” stoles and try to get our heads back above the ensuing waves. And yet, this is the place where it all comes together—the past promises that were made even as far back as the exile, that birth of the holy child that we just celebrated, and the rest—all of us that came after. The past now makes sense and the future becomes real. God’s Presence is always and forever in-breaking into this world. So, “Arise, Shine! For your light has come!” God is transforming all of us even as we speak. Why is it so hard for all of us to gain a sense of God’s Presence in the darkness? What signs of the sacred and transformation do you see now? What stands in the way of your seeing that transformation? Do we lose something of the story if we read this solely as a prophetic recount of Christ rather than in the context in which it was written? How would this message be received by our society today? What does this new order mean for you? If diversity is the “new order” and the “mystery for the church, what does that mean in our modern culture? Do we really understand the concept of Jesus as “Savior to us All”? It is not really any different for us. After all, what has changed? Has Christmas produced for us some sort of “new normal”? There are too many places in the world where wars still rage. There are children that went to bed hungry last night and people in our own city that slept outside wrapped in anything that they could find hoping to stay warm. There are families in Connecticut still grieving over the loss of their children to a mad man. And, in the midst of it all, Congress is still arguing over something called a fiscal cliff. What has changed? Well, not much. Truth be told, everything seems to have pretty much returned to normal. Many of us bemoan what seems to be a take-over of our Christmas by the culture and the society. We hear time and time again a calling to “put Christ back in Christmas”. Well, I don’t think that’s the problem. God in Christ has never left. We are not called to put Christ back in Christmas; we are called to put ourselves there. The story tells us that. The young Mary didn’t just come on the scene for a starlit evening. She was there, there at the cross. Her whole life became immersed in this child that she brought into the world. The shepherds stopped what they were doing, leaving their sheep on a hillside outside of Bethlehem with no protection from bandits or wild animals and thereby risking everything they knew, everything that would preserve their life the way it was. And those Wisemen? They never went back. They chose to go home by another way. What “other way” are we called to travel? What do you think of the notion that Jesus came to change not the world itself but us? 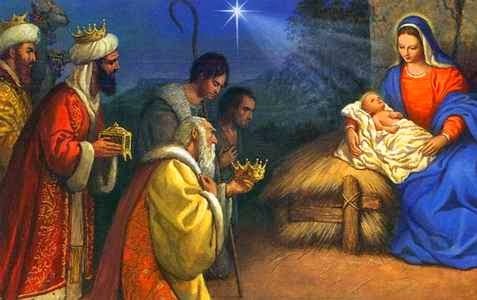 What new light (pun intended) does Epiphany shed on the meaning of Christmas for you?